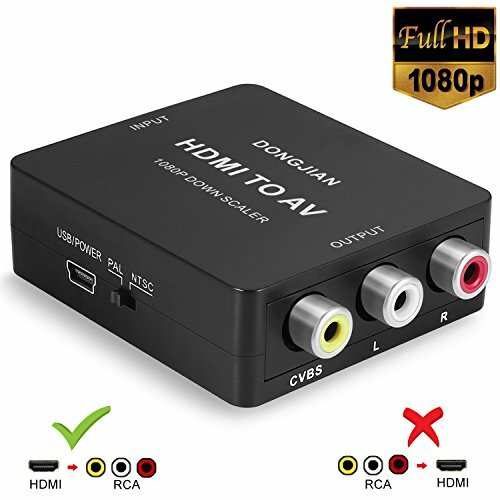 The Mini HDMI to RCA/AV Converter converts HDMI video/audio signal to AV(CVBS) composite video signal and the FL/FR stereo audio signals, supporting DVI system sideline signals. It helps users to convert high quality of HDMI video signal into normal CVBS signal(standard-definition 480i,576i), used on devices such as TV, VHS VCR, DVD recorders,etc, supporting two formats of NTSC and PAL. 1.Plug and play without drivers,portable and flexible. 2.Output audio is synchronous with video. Output ports: 1x RCA (Yellow, White, Red). 1) Please do connect the power cable with power first to make the unit work before connecting to other ports. 2) Video signal transferring only, unable to improve video quality. HDMI to RCA only: Convert HDMI digital signal to Composite CVBS video audio signal(AV signal) and automatically adjust the resolution ratio to best fit the display. HD Video output: Employ the latest video processing technology, enhance picture\'s Brightness / Contrast Ratio / Color. Enables you to play on TV, VHS VCR, DVD recorders, etc. Two TV formats output Selected:usually NTSC for America,PAL for others. Compatible with HDMI 1.3. Support HDMI input from 480i to 1080P, Does NOT support 3D. Easy Installation: Well sized, no need to install drivers, plug and play, portable and flexible. What You Get: 1 x HDMI to AV Converter,1 x USB Power Cable,1x User manual,30 days money back and one year warranty by DONGJIAN. If you have any questions about this product by DONGJIAN, contact us by completing and submitting the form below. If you are looking for a specif part number, please include it with your message.